I’m not much of a bread eater. When I buy a loaf of bread it usually languishes on my counter until I eventually throw half of it either in the garbage or out for the birds. I’m more likely to order a chicken breast or a wrap than I am a sandwich, and when grilling brats outside I generally opt for them to go bunless. That said, every now and then I do get a craving for a really good sandwich on fresh bread. Milio’s is a favorite spot because their sub bread – white and wheat (although I always go wheat) – is just the right amount of fresh and chewy and yumminess. 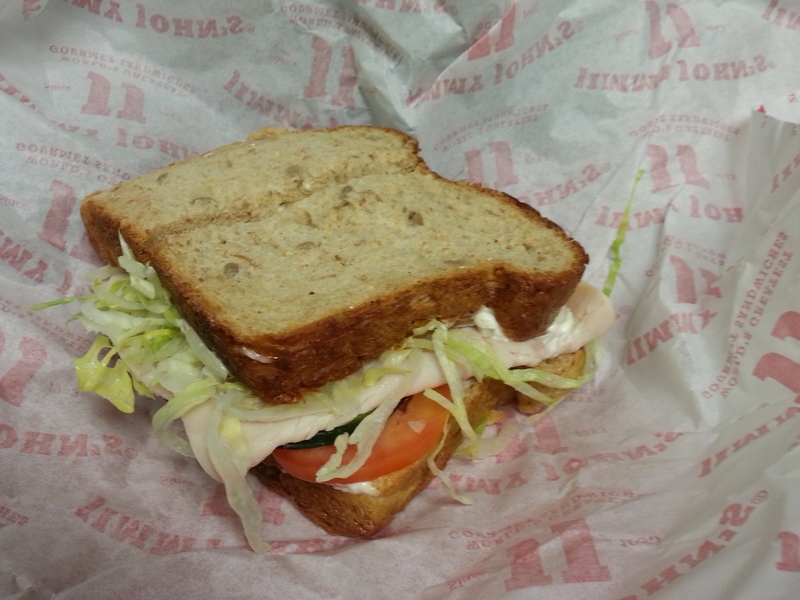 Every now and then I go to Jimmy John’s because I’ve always thought they were the same thing. My favorite sandwich at either place is the roasted turkey with avocado, cucumber, lettuce and tomato – at Milio’s I go inside and get it on a sub, but at Jimmy John’s I always end up with a regular sandwich on regular (although yummy) wheat bread. Today was one of those sandwich-craving days and because of a scaredy cat dog who kept me up all night during the storms, I didn’t leave for work until almost lunchtime. Trying to be smart, I planned to go through the Jimmy John’s drive-thru but specifically ask for a sub. Me: I’d like a Number 4 please, but can I get that on a sub? Worker: A sub? Sure, we can do that. Me: I’d like it on a wheat one, if that’s possible? Worker: Wheat? Sure. Is that all? In the two seconds it takes me to drive from the ordering tower to the window, I’m already thinking about how good that sub is going to be. It’s been a while since I’ve had one, and the bread craving is going wild. I get to the window, I pay for my sub and I’m handed … a sandwich. The one you see in the photo. Me: I asked for a sub. Me: Right. I asked for a wheat sub. This is a sandwich. Me: But it’s a sandwich. I asked for a wheat sub. Worker: We don’t have wheat subs. I stare at him. I want to argue. I want to say how nice it would have been for him to have told me that when I asked if a wheat sub was possible. I want to throw my sandwich at his perplexed little face and ask for a sub. Finally, I realize I’m staring and I mutter a small, “Whatever. Thanks,” and drive off, knowing the story he’s telling is about some crazy cranky old lady who doesn’t know the difference between a wheat sandwich and a sub. Ohhh, Molly—can I ever relate to this one today! Dang it all. The listening/comprehension translating into effective communition skillsets–or–lack thereof–are terrifying. Would you believe Mary Sharp and I just had this same conversation over our lunch today (which was done perfectly right and much appreciated). Sorry to go all agist here on this, but when a group of people live in a 144-character mode of communicating (or thinking they are), something is going to take a long tall dive off the cliff called ability to articulate at all levels. Let’s just hope this kid waits a few more years before he breeds! Ohhhh, I so agree! While I am a great proponent of social media (we’re Facebook friends, you see how often I post!) I do worry about the hit it’s delivering to communication skills – and this is just the tip of the iceberg. Snark is a good thing! Embrace your inner snarky self!